First the McDonald v. Chicago amicus brief drained all the oxygen from my atmosphere. Does Chicago have legitimate power to simply ban guns, as they've done, Bill of Rights be damned? Win OR lose, this Supreme Court case is gigantic for the Right to Keep and Bear Arms. If we win, and the states are unquestionably bound by the Second Amendment at last, all sorts of unconstitutional bans on our civil rights can fall. If we lose, and states are not required to comply with the Bill of Rights, all sorts of fallout at the local level will be good (think "Kelo case"), with federalism ("states rights") getting a big positive shot in the arm. Everyone seems to be rooting for federalizing gun rights, that's what our brief argues for, time will tell if that's good. I'm still waiting to see if I can secure seats at oral argument, and will deliver eyewitness reports again if I can. The Cartridge Family Band cracked up everyone as usual, and I can't thank the crowd enough for the ovation they honored me with for my speech on The American Way (posted here). George Washington was everything you'd expect as Father of the nation. The audience were tea-partier types in fine clothing -- invites went far and wide, but the left failed to show, imagine that. Here was the heart and soul of America, concerned and knowledgeable about our rights and the threats we face. The whole thing was videotaped, I'll have a link for the event soon, no need for me to expound. 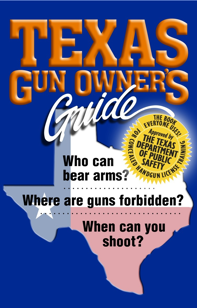 My main time sink has been the upcoming 7th edition of The TEXAS Gun Owner's Guide. It has absorbed nearly every waking hour for weeks, as I rush to the deadline -- the Feb. 26, 2010 annual meeting of The Texas State Rifle Assn. outside Dallas. 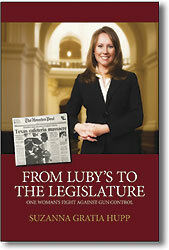 I'll have new books off press before that date, and man have things changed in the Lone Star State! Place your advanced orders now. I'll be at the TSRA Show along with fellow authors Suzanna Gratia Hupp, Chris Bird and Howard Nemerov (great autograph opps! ), 800-462-8772, tsra@tsra.com. If you're in Texas and you're not active with these groups, you're not doing all you can to preserve, protect and defend your right to keep and bear arms. Here's a New Year's resolution for you -- redouble your efforts through your state associations. We need you. You're an American, do it. Meet me at the 700,000-square-foot SHOT Show in Las Vegas, Jan. 18 - 21, 2010. I'll be pitching gun rights, American freedom and all my books and goods to the industry. Contact me at Circus Circus, 702-734-0410. Bomb Jokes at Airports -- my new book about the limits of free speech -- made it into our new full-color catalog before the book came out, thanks for your patience if you've already tried to get a copy. It's a blockbuster, and I expect to have it on press in a short while. If you want the catalog, just send me your street address and I'll send you a catalog for free. That catalog by the way has three new gun-action political novels that delight in our freedoms, a handful of new state gun-law guides, new buttons and stickers, a growing pile of women's items mixed in with the piles of men's items and more. Did I mention the catalog is free? We now have plain-English gun-owner guides for Massachusetts, Michigan, New Hampshire, North Carolina, South Carolina, Ohio, Virginia and -- New Jersey at last!, plus North and South Dakota in one book. Guides for 27 states, more coming. Know your laws, stay safe. be the first to get copies hot off the press, coming in January. What the media keeps calling "The Health Care Reform Plan" is nothing more than a health care takeover by socialists who've either infiltrated or brainwashed our government. Where is their constitutional authority to do any of it? There isn't any, and the media has long since stopped asking about that -- the only meaningful reporting there should be -- a total disgrace. When government is disconnected from the power delegated to it by the citizens, you have tyranny -- the "rulers" can do whatever they please. That MUST be overturned. Government doesn't have to start running summary executions to be recognized as corrupt despots who must be turned out. The 20,000 delegates to the political theater in Copenhagen had nothing to do with science or "saving the planet" (what a farce that phrase is!). Fortunately, some commentators did note that it's all about accumulating global power, and squeezing money out of people who earn it and giving it to people who do not. You've got to hand it to the socialists and brain-dead phony do-gooders, turning the weather into a rallying cry, and the air you exhale into a global calamity is unprecedentedly clever. The utter gall of "undeveloped" nations to demand money, and the unmitigated corruption of western "leaders" to beg for and promise money that isn't theirs to give. Hillary promises $100 billion? On whose authority? With what possible rational? It's grounds for removal from office, but that's on some long list of offenses already. Why doesn't most of Africa have indoor plumbing yet? Is that your fault? Will global taxation (a) fix it, or (b) just feed the power brokers? You get one choice. The media didn't get the memo. How many more Muslims have to blow themselves up, kill innocent civilians, rant about jihad, attempt attacks all over the planet, get foiled again and again by U.S. clandestine and overt operators here, before the media gets wise and starts reporting on global jihad? Don't hold your breath. The people in control of that farcical imitation of a news crew are among our worst enemies, hiding the truth from us, spinning and distorting what little leaks in. A Muslim warrior shouts Allah akbar and kills unarmed defenseless soldiers and the media says his motivation is being investigated? Puhleeeeze. The antidote is common sense. If the media says something, it's probably wrong. If you sense something, you're probably right. A Muslim from Nigeria trains with al-Qaida, sneaks explosives on board a plane to Detroit, fails to set them off because he got it wrong somehow, and our head of Homeland Security, my former governor Janet Napolitano says flying is now "very very safe," and that the attack "was stopped before any damage could be done. I think the important thing is to recognize here is that once this incident occurred, everything that happened should have happened." Who are these people? Did she make that up on her own, or did Obama's minions counsel her? She later backed off. Why? Which statement does she believe? Shouldn't someone pin her down? Nah. Two things stopped the attack -- the Muslim jihadi's own incompetence, and the plane's passengers who subdued him. The government's security measures were an abject failure, totally worthless. The media failed to mention that (well, they got to it much later). Napolitano should be forced to resign for nincompoopness. She was at least this bad in Arizona but local media hid it constantly. Now on the national stage it's much harder to hide. The official definition of moron includes her picture. The biggest inconvenient truth of the past decade was not that Al Gore got a Nobel prize (for making a movie) before Mr. Obama got one (for, well, nothing). It was because someone who knew something had to steal emails from a research center to let the world know the real inconvenient truth -- the global whining data had been manipulated, edited and massaged. And the people doing it threw away the raw data -- threw away the raw data -- refusing to release what scraps they might still have. With that on the table, tell me again why 20,000 people went to Copenhagen for, what, exactly? Who are those people? That's so many people they had to bring in hundreds of limousines from surrounding countries to meet demand. Not very green is it? The media failed to report on any of the core issues, but focused almost entirely on who was demanding what, and how 193 independent nations couldn't agree on anything (which was actually a good thing if you value sovereignty). Science was not part of the mix, and the stolen emails -- the real deal -- was treated as a side show. Did you see the pictures of where the temperature stations are located? Like in parking lots and strip malls (which were grassy meadows decades ago, no impact on measurements there, eh?) But accuracy of data doesn't matter, since it's falsified to fit the narrative anyway. When president Obama was in China, he had meetings, saw the Great Wall, had a wonderful time, and the world is a wonderful place. President Obama was in communist China, a brutal dictatorship that suppresses religion, free thought, free speech and even the right to assemble. A close friend and neighbor who has just returned from communist China had a wonderful time visiting, but was more than nervous about being in a country where soldiers are everywhere, carrying machineguns to keep control. No machineguns were seen or mentioned in any of the coverage provided by the mob of U.S. "reporters" accompanying the president. It was not clear at press time whether the mob of U.S. "reporters" with Mr. Obama were banned from filming or mentioning the ever-present machinegun-armed soldiers by the communist Chinese autocrats. Skeptics say reporters did it on their own to present a rosy image of the dictatorship, to fit in with an unwritten narrative that America is awful and the communist Chinese dictatorship is wonderful and a desirable and refreshing change from the freedoms we still enjoy here. And if “reporters” had not suppressed the "news" the dictator's forces would have done it for them. 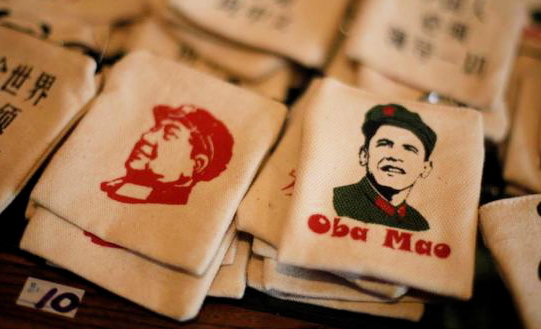 In other news, entrepreneurs living in China were marketing "Oba Mao" t-shirts and buttons with Obama dressed as Chairman Mao. I am not making this up. In still other news, my globe-trotting friend reports that construction in the Communist mainland is proceeding at breakneck speed, as the commies spend the billions of dollars flooding in, largely from U.S. WalMart stores. The construction crane is laughingly referred to as the national bird, where most of the world's cranes and most of the world's fresh concrete are now situated. A quick check of WalMart merchandise shows that so much of it is "Made in China" (actually, "Made in the communist Chinese dictatorship") that it would not be inaccurate to think of the world's largest retailer as a mostly owned subsidiary of the communist Chinese ruling clique. Chinese workers working for slave wages however do provide goods for Americans at very low low sale prices every day. Why U.S. reports refuse to use the word "communist dictatorship" in connection with the communist dictatorship is attributed to propaganda perpetrated by the lamestream media. Sarah Palin, after three years of instigation from the Uninvited Ombudsman, is using the phrase lamestream media, along with commentators on FOX news.